Scientists say they have finally figured out how smoking helps people keep off extra pounds. It turns out that nicotine activates a pathway in the brain that suppresses appetite, according to a study in the journal Science. This discovery should lead to better diet drugs, the researchers say. 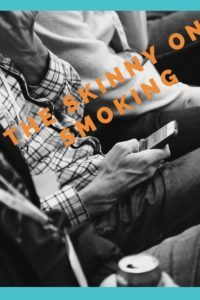 The finding comes after decades of research showing that smokers tend to be a bit thinner than nonsmokers, and that smokers who quit tend to put on weight. Researchers made the discovery after stumbling onto a major clue recently, says Marina Picciotto, a professor of psychiatry at Yale and one of the study’s authors. The clue turned up during experiments looking for chemicals to treat depression, Picciotto says. A scientist at Yale named Yann Mineur was giving mice a chemical that’s a lot like nicotine, she says. The scientists knew that nicotine must be triggering a response in certain brain cells. So they started looking at cells in the hypothalamus, a part of the brain known to regulate appetite. And they focused on a type of nerve cell, called POMC cells, known to be involved in eating behavior. Sure enough, nicotine made these POMC cells more active. But the researchers still needed to figure out how nicotine was communicating with these cells. To find out, the team took a closer look at the different types of receptors on the surface of the cells, Picciotto says. So the team looked at another type of receptor. These receptors don’t make you feel good — they’re involved in the so-called fight-or-flight response that occurs when animals or people encounter a threat. It turned out these fight-or-flight receptors responded to nicotine in a way that reduced hunger. That would make sense from an evolutionary perspective, Picciotto says. The nicotine research does not mean people should take up smoking to lose weight, Picciotto says. But for people who already smoke and want to quit, but don’t want to put on weight, she says, nicotine gum or a patch might help. Still, Picciotto says, any form of nicotine has a downside, and scientists who study weight loss agree. If people used, say, a nicotine patch, “you might find that patients do lose weight but then become dependent on a patch all the time,” says Michael Cowley, who directs the Obesity and Diabetes Institute at Monash University in Melbourne, Australia. Fortunately, Cowley says, Picciotto’s new research hints at a much better solution: drugs that suppress appetite without triggering the brain circuits involved in addiction. “What this shows is that there’s a whole new class of drugs that can potentially be used as weight-loss agents,” Cowley says. Picciotto’s lab has already shown that a nicotine-like chemical called cytisine causes mice to eat less. Cytisine comes from a natural source: the laburnum plant, a flowering shrub found in Eastern Europe, Picciotto says. She says it’s sold there as an herbal smoking cessation product.